Dirt archaeology is expensive. Even a modest dig can cost hundreds of thousands of dollars per field season with more required for lab work to analyze samples and artifacts. Institutions sponsor most projects. Occasionally a generous soul comes along who is willing to privately fund excavation out of an altruistic motivation to advance scientific knowledge. I have met three such noble individuals. Tim Tucker sponsors research at various sites in the state of Puebla, Mexico. Joe V. Andersen funds excavation in the department of Baja Verapaz, Guatemala. Alan Rudd supports field work at the Beit Lehi site about 35 kilometers SW of Jerusalem. All three men have an admirable sense of mission arising from a deep personal and spiritual connection to the lands they study. All bristle at cavalier scholarly criticism which they view as cheap shots enabled by the relatively facile act of putting pen to paper. In contrast, these hardy explorers are fully invested, having expended considerable time and private treasure probing the significance of their chosen sites. 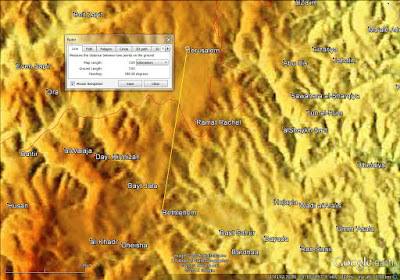 Beit Lehi has gained some notoriety among students of the Nephite text as a candidate for the Judean home of Lehi, Sariah and their children. Many LDS scholars, led by Jeffrey R. Chadwick of the BYU religion faculty, debunk that idea as a myth. The crux of the issue lies in the interpretation of 1 Nephi 1:4 and 1 Nephi 1:7. The text says Lehi dwelt and owned a house "at Jerusalem." Does that mean the walled city proper or its environs round about? As we have found dozens of times before in dealing with geographic questions, the text on this point is clear and unequivocal. "At Jerusalem" in Nephite parlance meant in the land of Jerusalem and was not limited to the urban area in the capital city. 1 Nephi 1:4 Lehi "dwelt at Jerusalem in all his days." 1 Nephi 1:7 After witnessing a pillar of fire upon a rock, Lehi "returned to his own house at Jerusalem." 1 Nephi 2:13 "The Jews who were at Jerusalem" sought to take away Lehi's life. 1 Nephi 5:4 Had Lehi not seen visions he would have "tarried at Jerusalem" and perished with his brethren. The Kingdom of Judah was destroyed by the Babylonians under Nebuchadnezzar in a series of military actions ca. 597 - 582 B.C. The context for these passages is explained in Nephi's colophon: "The Lord warns Lehi to depart out of the land of Jerusalem" and "Nephi taketh his brethren and returneth to the land of Jerusalem after the record of the Jews." 1 Nephi 19:13-14 In Nephi's gloss on Zenos, he explains that because they will crucify the Christ, the Jews "who are at Jerusalem" will be scourged by all people, wander in the flesh, perish, become a hiss and a byword, and be hated among all nations. This is an accurate description of the Jewish diaspora and holocaust. 1 Nephi 19:20 explains that Nephi, like earlier prophets, saw in vision the destruction decreed "for those who are at Jerusalem." The Lord was merciful to Nephi, warning him to flee and avoid death. 1 Nephi 19:22, 2 Nephi 1:3 and Ether 13:7 all provide context. The land of Jerusalem was destroyed. 1 Nephi 22:3-4 Many in scattered Israel "are already lost from the knowledge of those who are at Jerusalem." The more part of the tribes will be scattered upon all the face of the earth, and also among all nations, and upon the isles of the sea. 2 Nephi 6:8 In Jacob's gloss on Isaiah, he explains that "those who were at Jerusalem, from whence we came, have been slain and carried away captive." After describing the Savior's mortal ministry and crucifixion, Jacob prophesies the Jewish diaspora, holocaust, and eventual return to "the lands of their inheritance." 2 Nephi 6:9-11. 2 Nephi 9:5 Jacob refers to prophecies that the Savior in his mortal ministry will "show himself unto those at Jerusalem, from whence we came." 2 Nephi 10:3-6 Jacob again speaks of the mortal ministry of the Savior among the Jews who are in the more wicked part of the world. He calls them "they at Jerusalem" and prophecies the Jewish diaspora at the hands of the Romans. Alma 7:10 could hardly be more explicit. Bethlehem was "at Jerusalem which is the land of our forefathers." Alma 11:4 Mormon says the Nephites used a different measure of stored value than "the Jews who were at Jerusalem." Helaman 16:18 refers to the mortal ministry of the Savior "unto them who shall be at Jerusalem." 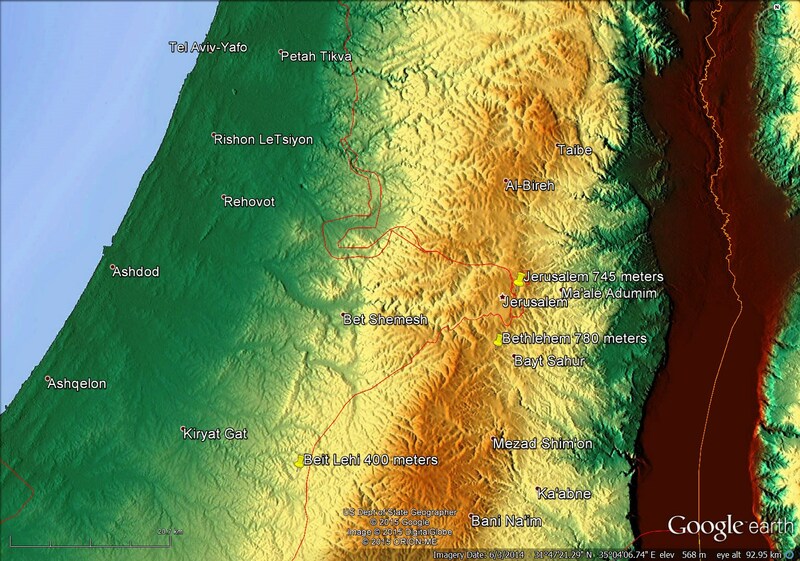 Helaman 16:19 clarifies that the geographic referent is "the land of Jerusalem." 3 Nephi 10:5 The risen Lord compares "ye people of the house of Israel, ye that dwell at Jerusalem" with the fallen Nephites and Lamanites. 3 Nephi 15:14 The risen Lord tells the Nephites that knowledge of them was withheld from "your brethren at Jerusalem." In the following verse the Lord again refers to "them" who are in "the land." 3 Nephi 16:4 The risen Lord says "my people at Jerusalem" are "they who have seen me and been with me in my ministry." Earlier in the passage He describes the geographic referent as "the land of Jerusalem." 3 Nephi 16:1. 3 Nephi 17:8 The risen Lord perceives that the Nephites wanted to see the same healing miracles He had "done unto your brethren at Jerusalem." 4 Nephi 1:31 "The Jews at Jerusalem sought to kill Jesus." Conspiracy against the Savior is attested as early as Matthew 12:14, Mark 3:6, and Luke 6:11. Close reading of all 19 occurrences of the phrase "at Jerusalem" in the text shows a consistent pattern. "At Jerusalem" among the Nephites meant in the land of Jerusalem and environs. It was not limited to the capital city itself. This does not mean Beit Lehi was the ancestral home of Lehi and his family, but it means Beit Lehi could have been Lehi's home, contra Chadwick. In a conversation with John W. Welch on Thursday, June 18, 2015, he indicated that the Semitic phrase translated into English as "at Jerusalem" connotes "near Jerusalem" and clearly does not imply a location within the city proper.